money for my mother’s quilting thread. the only thing I know. Legacy: what do WE want? I’m trying something different here, going out on a proverbial limb, to approach a particular topic from many potential angles. I want to break it down and stare at it under the microscope. Then, I want to put it back together again along with the new insights I’ve hoped to have gained to see what it looks like with my broadened understanding. This process should take more than one blog post. I am not even completely sure at this point exactly where we might end up. But, if you choose to take this journey with me, I hope we both get some surprising insights into an idea that probably dominates writers as much if not more than anyone else on this planet, and that’s the concept of legacy. 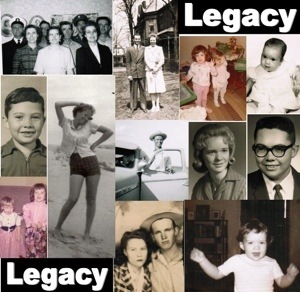 Say the word legacy, and the first thing that pops into many people’s minds is family, more specifically the children they have and what those children will go on to do in this world. Others see legacy as the accomplishments that will outlive them, such as a public building they helped to erect or the miracle cure they discover. Living in America, where life’s dreams are often equated with visions of success from a capitalistic perspective (let’s face it, you mention the word legacy and rock stars or Rockefellers come to mind long before Mother Theresa), it may shamefully take us a moment to reach the point where we begin to define legacy from a Godly perspective. But when Christians do make it to that perspective, they can take actions with God’s help that have ripple-effects that will truly pass on to generations. God Himself explains the workings of legacy at the family level, as to the seventh generation will those who deny Him be affected. It seems likely that those who serve Him will likewise affect how future generations of their families interact with God. For those of us who do not have children, the definition of family in connection to legacy has to be re-thought, in an outside-of-the-box kind of way. And that expanded definition of whom we potentially affect as we take our walk with God on this earth can actually apply to every one of us. At its most fundamental starting point, legacy makes us ask a simple question that can be hard to answer: What do I want to be remembered for? The more haunting question, of course, is will I be remembered at all, but we can’t touch on that dilemma until we have at least broached the first question. What do we want when it comes to our legacy? As a writer, I think we all secretly want to write the great American novel, but most of us realize that we are lucky if just one person besides our grandmother reads what we’ve written and is affected by it. I’ve struggled with my purpose in life for many years, always assuming God wanted me to do something bigger, something better, something more. But my definitions for those words were always being driven by the capitalistic reality in which I lived. If I didn’t achieve according to the world’s standards, I assumed I was failing God in some way. It wasn’t until I started to see the way God might use my talents in smaller circles that I began to find some peace with my purpose, my potential legacy. I have words to write only because God gives them to me (at least He gives me the writing that is any good; the blame for the bad stuff lays right at my feet!). All I can do is put the words down and have faith they will reach their intended target, even if the one person needing the words is only me. Before we start breaking down what a Christian legacy looks like, think on your own feelings about legacy. What do you want the world to remember about you? What footprints do you hope to have laid down so that others might follow? This phrase is something anyone who knows me will recognize as a regular litany coming from me. I don’t think I’m alone in feeling this way, though I am quite sure there are many more people who bear this universal challenge with more fortitude and less verbosity than I tend to manage. The Ration Book, an artifact from the World War II era, reminds us of a time when the idea of too much to do and too little time (not to mention resources) took on depths of meaning that only those who experienced it can truly understand. For those of you who slept through your history classes, Ration Book coupons were required throughout the second world war to buy the supplies that were scarce, from sugar to gasoline. My old-time radio station even played a vintage commercial the other day where the spokesman urged housewives to save their used grease to turn in for making rubber! Households planted Victory Gardens to reduce the load on agricultural resources. The public was provided with toll-free numbers to contact in order to learn pointers about canning. There was so little to go around, it became everyone’s job to make sure nothing was wasted. Like a country fighting a global-wide war on multiple fronts, each of us has only so many resources with which to accomplish what we feel is required of us in this life, whether that be work goals, family responsibilities, maintaining our households, or writing a blog! The choices we make every day determine how much we have available for the next thing we have to do. If we don’t prioritize well, we may wind up using all our resources on things that really don’t matter too much in the grand scheme of things. Making the effort to map out what we do and why we do it might just give us an insight into better resource management. We should create our own Ration Book, making sure the items on our to-do list that are really important actually get done. And shouldn’t God and His goals be at the top of our resource and to-do list? I am thankful as I reflect on the struggles and sacrifices that were required during World War II that God alone has no Ration Book. His resources are limitless. The love and support He has to offer are without end. We can dip into the truths of His word and go to Him in prayer as often and as long as we like, and we will never run out of “coupons.” The armor of God that Paul encourages us to put on will never fail us. And, many times, God’s love provides us with resources we didn’t realize we had in order to accomplish His will. In this finite reality, only our ability to reach toward the Infinite through the intercession of Christ makes it possible for us to expand our Ration Books so that His love may be experienced by non-believers through us. In biology, we learned that two living things so entwined have a win-lose or win-win situation. In other words, my backyard plants are either in a parasitic or symbiotic relationship. Parasites live off their hosts at the host’s peril. In a symbiotic situation, both parties benefit from the intertwined relationship. As I spent my twenty minutes on my stepper looking out at this situation, I pondered what lessons I could learn about my own life from this picture of nature. 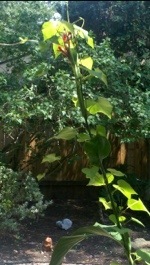 I am, after all, entwined with God much like my two plants. But is that relationship symbiotic, or am I just a parasite, taking from God without giving anything back? How do I increase my own value to God? How did I do it this week? Some of the quick answers that came to me were the too few times I expressed love to others through my words and actions during this week. Also, I have spent time praising God in my prayers this week. Knowing that loving and helping others, especially strangers, is a sure way to please God is a pretty easy answer to the symbiotic question. Studying the prayers of the Bible, especially the Psalms, also lets us know that God relishes our praise. He may not need it, but He gets something from it. Why, after all, did He create us in the first place, then give us the free will to choose to worship Him? I know that I am only saved by grace and not through any action that I take other than the action of accepting that grace, but I certainly don’t want to live my days being a parasite to God. I would much rather have a symbiotic relationship. So, thank you, God, for creating a world so beautiful and reflective of Your wonder, that is even awesome at its most terrifying and destructive moments, and that always manages to offer us glimpses of Your peace. May we believers live in ways that somehow reflect that wonder.